The new current generation Honda HR-V is a huge departure from the bland and boxy MUV with the same name available back in 1999. Come in recent times, and you get a contemporary crossover with a bold design in and out and Honda’s expertise in mechanical aspects. The Honda HR-V comes with a curvy and aggressive design inspired by that of the Civic, which in itself is a good thing, to begin with. The sportiness of the outside is well carried out on the inside as well, with a driver-focused cabin which is loaded with features as well. Positioned between BR-V and CR-V, this premium crossover is being offered with the same 1.8-litre petrol engine which is there under the hood of the Civic, as standard. Coupled to a CVT gearbox, this engine pumps out a maximum power output of 143 PS and a peak torque output of 172 Nm. Have a question on HR-V? 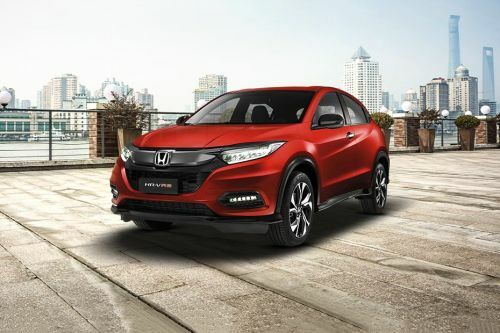 HR-V is available in 5 different colors - White Orchid Pearl, Modern Steel Metallic, Lunar Silver Metallic, Ruse Black Metallic and Passion Red Pearl. Watch latest video reviews of Honda HR-V to know about its interiors, exteriors, performance, mileage and more. To meet with the rising demand of compact crossovers all across the world, Honda came up with HR-V back in 1999 for the first time with a boxy and utilitarian design. However, since the global market has tilted its focus more towards SUVs and crossovers, so did Honda in 2016, and what it came up with was an all-new bold and sharp looking second generation HR-V which not only changed the fortunes for the model but also for Honda. The Hi-rider Revolutionary Vehicle, which the HR-V stands for, is a 5-seater premium crossover which sits between both the 7-seaters from Honda in Malaysia, BR-V, and CR-V. Available only as a petrol model with one engine option, the HR-V is offered in three different variants, with CVT transmission mated to a 1.8-litre petrol engine as standard in all of them. On the inside, the HR-V is again a typical Honda product which focuses more on sporty appeal. Like all the other Hondas, the all-black cabin has an unsymmetrical design which looks a mish-mash of thoughts but surprisingly is very functional and practical. The steering wheel here on the HR-V is something which we have seen on all the current generation Hondas, with round themed buttons for audio, Bluetooth and cruise controls and silver garnish at the bottom. The instrument console complements with the sporty appeal of the overall car, thanks to the blue backlit console. The center console comes with a unique design which has a linear theme in its design and comes with longitudinally placed AC vents on the passenger side, which looks very different from what we have seen on cars from this class. The 7-inch touchscreen infotainment system is tilted towards driver’s side, like in all the other Hondas, which is functional but misses out on many modern aids like advanced smartphone connectivity features and navigation. As far as space is concerned, the cabin feels slightly short on space, with limited legroom on offer and sloping roofline eating out the headroom a bit. However, the cabin of the HR-V is fully loaded with all the features one expects from a premium compact crossover, such as cruise control, push-button start with keyless entry, electric parking brake, tilt and telescopic steering, leather upholstery, touch-sensitive panel for automatic climate control and electrical adjustments for rear view mirrors. However, given the competition is rising fast, a couple of more unique features would have been welcomed. It was the HR-V with which Honda decided to make its SUVs and crossovers as snazzy looking as its sedans. The current generation HR-V, by all means, is one sharp looking crossover which has equal amounts of curves to make it feel modern and contemporary, which is true, considering the fact that this whole design is now nearly three years old. The HR-V borrows a lot from its other stable mates from Honda. Take for instance, the front fascia. The wide front grille is typically Honda trait with the large and wide Y-shaped face which engulfs a hexagonal grille, atop of which sits a simple chrome finished strip with Honda’s logo sitting in between. The sharp and angular headlamps flanking the upper corners of the large grille makes you remind that of the Honda Civic, which comes integrated with full LED headlamps with LED daytime running LEDs, thus going with the modern trend of LEDs. While the front end of the HR-V looks muscular, the side profile of the crossover smoothens out a little bit, with the overall profile being more like that of a coupe than a boxy crossover, thanks to the curvy roofline. While the side body cladding and big diamond cut alloy wheels add some muscularity to the design, the two door look thanks to the integrated door handle in C-pillar and curvy roofline makes it look sportier than all the similarly spec-ed crossovers. At the rear, the HR-V looks slightly less dramatic as compared to the front, with the sharply raked windscreen and small tailgate design making it lose out on bulk appeal. However, the design is edgy here, which gets complimented by the presence of large and edgy but oddly shaped tail lamps. The coupe-like profile of the HR-V might confuse you of its driving dynamics, however, thanks to the large 17-inch wheels and a ground clearance of 198 mm, the HR-V is capable of tackling all bad roads with ease. The HR-V comes with the industry standard McPherson struts at the front and torsion beam at the rear, which here, are set on a slightly stiffer side. For the Malaysian market, Honda has equipped the HR-V with only one engine option – the tried and tested 1.8-litre four-cylinder naturally aspirated petrol motor which we have already seen and experienced in the Civic for a very long time. The engine, in the typically Honda manner, is butter smooth and silent but turns wild and rev-happy when you want it too. In the HR-V, this engine produces a maximum power output of 142 hp and a peak torque output of 172 Nm. The engine is mated to a CVT transmission shared with the Civic and the City, however, the HR-V misses out on the paddle shifters which are present on the latter two. Like all the other aspects mentioned above, the HR-V is a typical Honda car even on the aspect of safety as well. The car is well equipped with all the safety features one could expect from it, such as dual, side and curtain airbags, ABS, EBD, vehicle stability control, emergency stop signal, lane change assist, hill start assist, brake assist, electric parking brake, parking sensors, ISOFIX mounts and seat belt pre-tensioners with force limiters. The Honda HR-V is a match-up of Hondas from the past coupled with new generation crossover touches. While the crossover impresses you with its edgy and funky design on the outside, the interior design might let you down with its quirky layout. However, following the family trend, the HR-V feels solidly built and its engine scores high on refinement and power delivery. The interior space and comfort might not match up to the high standards set up by the sedans from Honda, but mind that it’s a crossover, so that can be understood a bit. What are the Safety Features Available in Honda HR-V?